These short performances will take place Thursday, March 5, and Friday, March 6, at 6 and 7:30 p.m. each night in the Visual Arts Building. 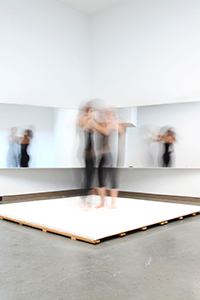 Donna and Marvin Schwartz Artist-in-Residence Dana Haugaard premieres "Now, More Than Ever," a sound and sculpture installation, March 5-6 at the Emory University Visual Arts Gallery. Haugaard’s work plays with sensation and stimulation, with the goal of enabling the audience to gain a heightened sense of self-awareness. Working with sound, he creates reactive environments with sensors and audio controllers that use both low and high frequency sine waves to physically affect viewers and the space. Low frequency waves can be felt vibrating deep inside the body. High frequency waves find the resonant frequency of objects and structures, causing them to vibrate. The installation also features choreography by Atlanta artist Blake Beckham performed by Beckham, Emily Hammond and Julianna Joss. These short performances will take place Thursday, March 5, and Friday, March 6, at 6 and 7:30 p.m. each night in the Visual Arts Building (700 Peavine Creek Drive, Atlanta, GA 30322). Admission is free and open to the public. Parking is available in the Peavine Parking Deck on Emory’s campus. Dana Haugaard started making and studying art during his time at Emory University where he double-majored in art history and visual art. He maintained his public art practice in Atlanta until 2009 when he began his graduate art degree at the University of Iowa, graduating in 2012. His work has been shown at the Urban Institute of Contemporary Art in Grand Rapids, Michigan; the State Historical Museum in Des Moines, Iowa; and he has been a resident at Hambidge Center for Creative Arts & Sciences. Haugaard is currently a Donna and Marvin Schwartz Artist-in-Residence at Emory. Blake Beckham is a choreographer, producer and educator in Atlanta. She co-directs The Lucky Penny, a presenting organization with the mission to advance artistry and cultivate community through daring, experimental performance work. Blake’s artistry and leadership have been recognized with a prestigious SEED Fund Grant from The Robert Rauschenberg Foundation, Tanne Foundation Award, Community Impact Award from Emory's Center for Creativity & Arts, and many of Creative Loafing Atlanta's “Best Of” distinctions. Her work has been supported through residencies at Theater Emory and Performance Works Northwest, and through competitive grants from Idea Capital Atlanta, Fulton County Arts Council and more.